Tech Blog with latest tech news CopyShould Best Remote Desktop Software Tech Blog with latest tech news CopyShould!! Remote Desktop Access is a great way to keep in touch with the files on your desktop and manage them from any possible location and also to help your acquaintances with troubleshooting their issues remotely. Also for developers, remote desktops are a great way to speed up the deployments. Data centers are remotely configured using remote desktop applications and are the norm in industrial applications. While the upsides to remote desktop is too good to be ignored, the right tools are needed to connect with your friends and family safe and secured. One of the most popular and widely used Remote Desktop software is ‘Teamviewer’ and we will be looking at a few alternatives that better this tool. Why the need for Teamviewer Alternative? While Teamviewer is a handy tool for getting started on remote desktop, it doesn’t provide the simplicity and reliability expected from such a tool. Security is one primary concern that causes many users to flock away from Teamviewer, if not properly configured. Your system is directly put in risk if the average user doesn’t configure the settings on this tool appropriately. Even though the personal license version is for free, Teamviewer charges a hefty fee for the business version. Although Teamviewer features many useful functionality like file transfers, collaborations and mobile access, there are better Teamviewer alternatives should you decide to do away with it. Here are the 10 best alternatives to Teamviewer that you can opt for your remote desktop activities. Windows Remote Desktop Connection is a free feature built into the Microsoft Windows Operating System. This setting can be accessed from the computer’s System settings, found in the control panel. The router of the remote PC needs to be routed on the port 3389 to direct it to your PC. Multiple PC control at a time is not something that this tool is capable of. This nifty tool is great for users beginning out on Remote desktop clients and do not want to install any additional software to get the work done. Key Features: Fast and complete access control over a remote PC, Easy to set up and already built into Microsoft Windows. Why you should opt for Remote Desktop Connection? The tool is simple, easy-to-use and comes built-in with your edition of Windows OS makes this tool a great fit for beginners and dabblers, beginning out on Remote desktop applications. If you are looking to a less bloated remote desktop client, Remote Desktop Connection is your best choice. Pricing: Free, Built into Windows Professional, Ultimate and Business versions. RealVNC provides both free and paid versions of the Remote Desktop Client, built on top of VNC framework. The VNC technology, or Virtual Network Computing is an open-source technology upon which this tool is built. Although somewhat more complicated that Teamviewer in setting up, VNC offers a reliable and secure connection. This cross-platform utility helps you connect individually to a remote computer or also connect multiple PC’s behind a public IP Address. Key Features: Cross-platform remote control, VNC authentication, Encryption, File Transfer, Chats, etc. Why you should opt for RealVNC? Although a bit difficult to configure the network getting started with your remote connection, RealVNC offers the reliability and features like encryption, collaboration tools and chat features to make sure that your remote connection bodes well for the person on the other end of it. Supported Platforms: Windows, Mac OS X, Linux, UNIX, Ubuntu, Raspberry Pi. Pricing: Free for Private use, $30/desktop for Personal commercial use and $44/desktop for Enterprise use. 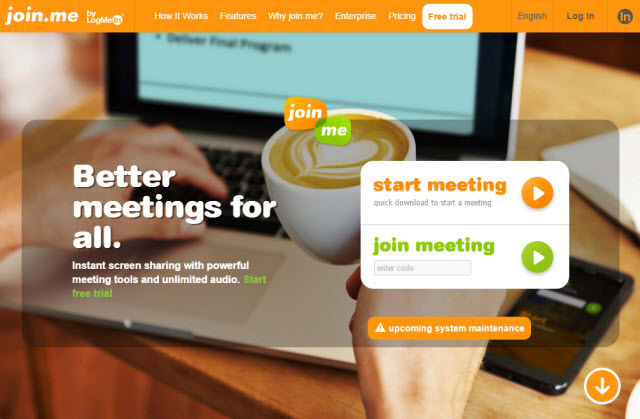 Developed by LogMeIn, Join.me is a premium remote desktop service that lets business run remote meetings, with people located anywhere across the world. Their instant screen sharing tool offers a better way for meetings and the paid versions offers up to 250 participants to join the meeting and a presenter swap lets people share their viewpoints across the attendees. Join.me is easily the best collaboration tool trusted by hundreds of universities and Fortune 500 companies. Key Features: Mobile Apps, Unlimited audio, Recording, One-click meeting scheduling, Up to 250 participants and presenter swap. Why you should opt for Join.me? If you are running a business or even for individual purposes you need to collaborate remotely with people, Join.Me is a great remote management tool that you can use. A fast, easy and better way to connect and collaborate with people remotely is what Join.me is all about. Supported Platforms: Windows and Mac OS X. Pricing: Free for Basic VoIP, $ 15/mo for Pro plan and $19/mo for Enterprise plans with premium meetings and advanced management. 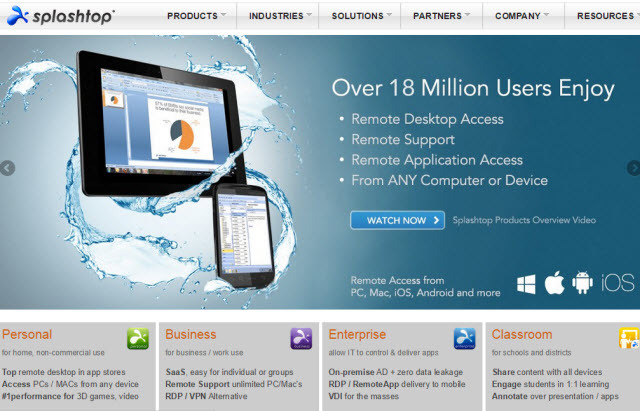 Splashtop offers free and paid remote desktop solutions for individuals and businesses alike. You can use the tool for Free if you are using it for personal purposes on up to computers. Setting up the tool on your Windows or Mac and accessing remotely over your Android or iOS based mobile phone is what Splashtop achieves pretty spectacularly. There is minimum latency on audio and video streaming, so that makes it easier for you to even enjoy your media remotely. Key Features: Stream audio and video, manage and transfer files, Free for personal use up to 5 computers. Why you should opt for Splashtop? If you are using the remote desktop solution primarily for accessing media remotely and for little of troubleshooting purposes, Splashtop will make a great remote desktop companion. The experience provided by Splashtop in Remote desktop accessing is pretty amazing and its secured cross-platform support, with a minimal cost makes it one of the better Teamviewer Alternatives. Supported Platforms: Windows, OS X, Linux, Android and iOS. Pricing: Free for 6 months, $1.99/mo after that (Individual use); $60/yr per user for Businesses. 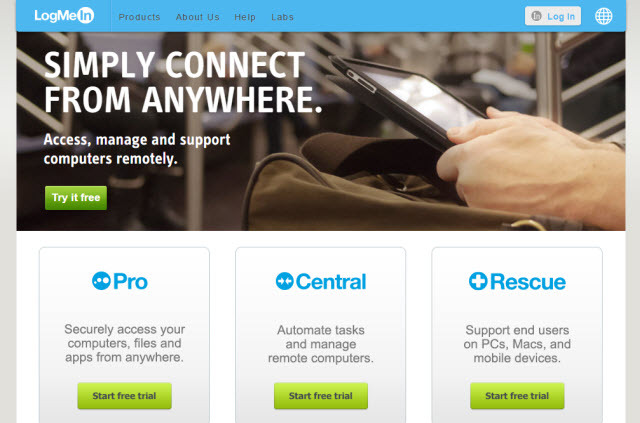 LogMeIn offers one of the best remote desktop solutions to individuals and businesses alike. Although the free version of LogMeIn was discontinued recently, that doesn’t keep it from being listed as one of the best alternatives to Teamviewer. With many key features like file transfer and accessing of local printer, LogMeIn still serves as one of the best premium alternatives to Teamviewer. Key Features: File transfers, Audio and video streaming, Full-remote access to transfer files, print documents to a local printer and share documents with collaborators. Why you should opt for LogMeIn Pro? LogMeIn Pro offers a unique prospect for remote desktop accessing and it is one of the best of its kind. Although priced somewhat less than the Teamviewer app, LogMeIn offers features that are non-existent in many remote desktop applications of its kind. Pricing: $99/yr for Individuals (Access up to 2 computers), $249/yr for Small businesses with 5 computers and $449/yr for Businesses with 10 computers. Another tool based on the VNC (Virtual Network Computing) technology is UltraVNC. This is a free tool developed for systems based on Windows to remotely access other systems. You can completely work on another remote system once the connection is established. File transfer is also allowed in this tool and that makes it a handy little free tool for quickly establishing a remote connection and getting your work done. 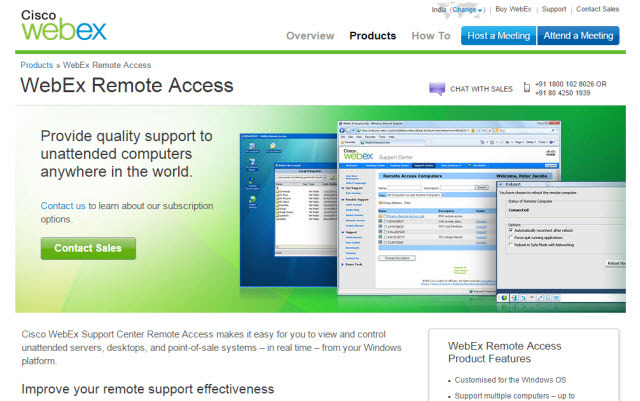 Key Features: Complete remote access of desktop, File transfers, etc. Why you should opt for UltraVNC? UltraVNC is a completely Free solution to remote desktop applications and offers a simple setup process that gets you connected in a matter of minutes. Use this tool for instant remote file sharing or helping someone remotely troubleshoot their issues. 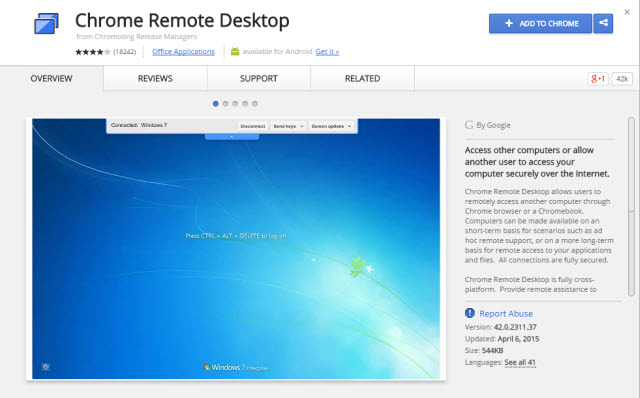 Another one of the Teamviewer alternatives that even does away with the need of installing a software is the Google Remote desktop application. This free tool is available as an extension for Google Chrome browser, accessible on any operating system running it. The add-on lets users remotely access any desktop and its contents right from their browser. Key Features: Google Chrome-based remote desktop accessing, Access to files and folders and Fully secured. Why you should opt for Chrome Remote Desktop? If you are looking for a remote desktop solution without even the need for leaving your web browser, this nifty add-on will get you the work done. Setting up is simple and the add-on costs nothing in addition to providing an easy-to-use setup for getting your remote desktop connected. Cisco’s WebEx is more than just for conducting meetings. This free and premium tool lets you remotely connect with people based on different systems through the free mobile or desktop applications. These remote desktop setups albeit have to be an attended one on the other side. The one hosting the meeting could share his desktop and choose to pass over the control of mouse and keyboard to other presenters. Sharing files, chat and face-to-face live interaction are also capable with this tool. Key Features: Video conferencing, Markup tools, Recording meetings, Free mobile apps, Scheduling in Outlook, Password protected messages, etc. Why you should opt for WebEx? If you are looking for a premium business solution or just for remotely accessing a desktop with added bit of interaction to it, Cisco’s WebEx would be a great fit for your needs. 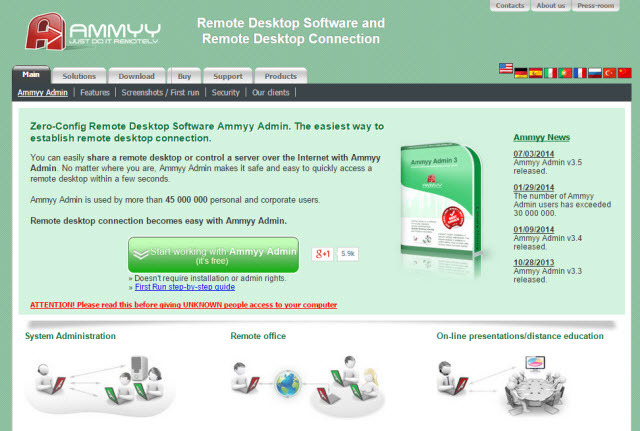 AMMYY Adminn is a free remote desktop solution for both individuals and businesses alike. The tool, unlike heavy remote desktop software, comes in as a tiny application, under 1MB. You can also perform actions like file transfers and live chat in addition to remotely connecting to the other system. Secure connection and easy to manage software makes AMMYY Adminn one of the most preferred free remote desktop clients. Key Features: Easy to setup, System administrations, Remote office and presentations, Built-in voice and Text chat, etc. Why you should opt for AMMYY Adminn? AMMYY Adminn leaves behind a shorter footprint when it comes to software requirements. The tool is pretty nifty and very low data consuming one which gets professional remote desktop accessing features for free. Simple to setup and get around with is one of the primary reasons that many users opt for this tool. Pricing: Free for non-commercial uses; The Starter, Premium and Corporate licensed tools are priced at $33.90, $66.90 and $99.90 respectively. Although priced a bit heavily for business users, Mikogo is a great premium tool for businesses and individuals with commercial purposes. The tool is completely browser based and no need for software or plugin installations. Tons of features is what Mikogo comes packed along with. The cross-platform browser-based tool is great for remote support, conferences/meetings and other remote desktop purposes. Key Features: Fully browser-based – no downloads or plugins, Share documents, swap presenter, Remotely control a desktop, Free mobile app,s video conferencing, Multi-user whiteboard, File transfer, chat and more. Why you should opt for Mikogo? 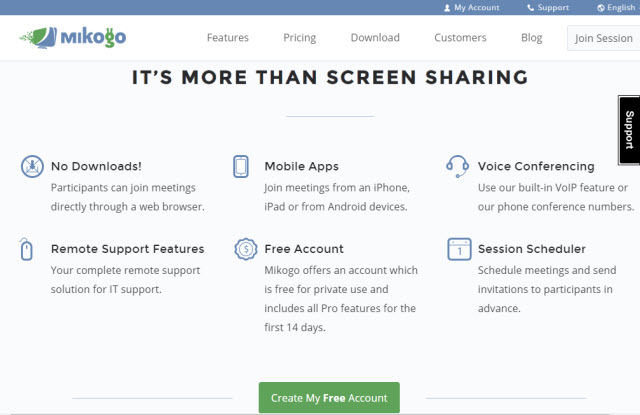 Tons of features and the best value for your money is what you get with Mikogo. This heavily featured tool also comes with VoIP chat protocol in addition to the previously mentioned host of features with it. Opening up your browser and getting started with it is made simpler without even the need for installing any application or plugin. Supported Platforms: Browser-based – Works on PC, Mac, Linux, iPhones, iPads and Android mobile devices. Pricing: $13/mo for 3 participants, $19/mo for 25 participants, $39/mo for 25 participants & unlimited hosts and $78/mo for 25 participants with 3 session channels. How Can Free-Up More Hard Drive Space?